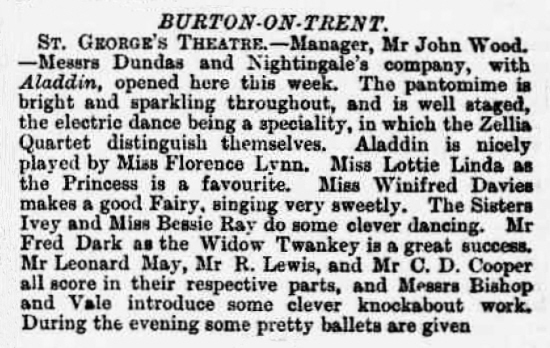 Patrons of the Leamington Theatre Royal have this week been afforded a change of fare in the shape of a pantomime produced by Messrs. H. Dundas’s and J. W. Nightingale’s company under the personal supervision of the former. The pantomime is founded upon the fairy story of “Aladdin and the Magic Lamp,” and was produced in several towns with considerable success before being brought to Leamington. It cannot be said to be one of those fine spectacular shows which are now so popular with the public, partaking, as it does, more of the nature of a burlesque performance in which knockabout business is freely introduced. The book by Mr. Harry F. McClelland, the author of several well known pantomimes, and the greater portion of it is brightly written, but some of the business introduced by the knockabouts is neither new nor very original. At the same time there is much at which one can laugh. There are also one or two pretty songs introduced in the various scenes and some graceful dancing, but the music for the most part is not in any sense as catchy as that associated with some former productions of a similar kind. The pantomime comprises the usual chrematistics in the shape of bright costumes, dances with electrical effects, and interchange of scene and the fairly good house which assembled on Monday night to witness the first performance, appeared to be very well satisfied with all they saw and heard. Some of the songs were encored and at times during the evening applause was liberally bestowed. 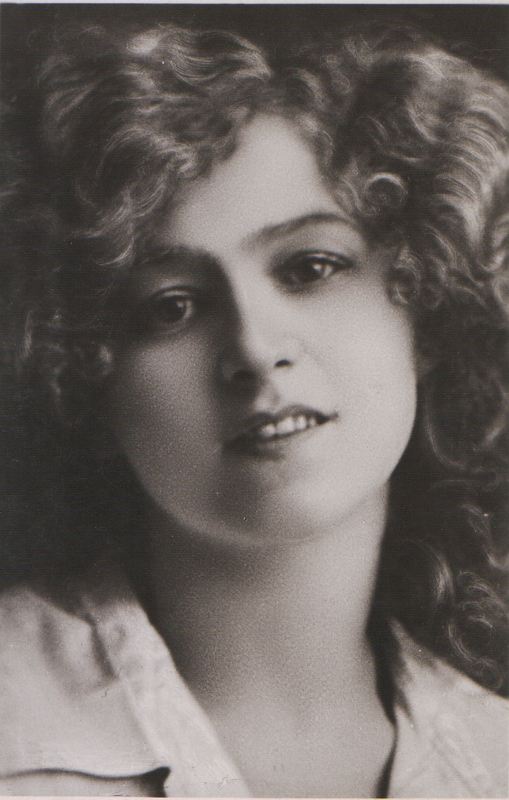 One of the most pleasing features of the production is a very graceful exhibition of the terpsichorean are by the little Bessie Ray, who is likewise a cleaver vocalist. Of the artistes included in the company some are exceedingly capable. Miss Florence Lynn makes a graceful Aladdin and is also a vocalist of some ability. Miss Lottie Linda sustains the role of the Princess with ease and grace, whilst Miss Winifred Davies makes a smart looking fairy. Mr Fred Dark gives an amusing and diverting performance in the character of Widow Twankey and his burlesque of a prima-donna is exceedingly amusing. Mr. Leonard May as Abanazar, Mr.R. Lewis as the Emperor, and Mr. C. D. Cooper as the Vazier are all good in their respective parts. Bishop and Vale contributed a good deal to the amusement of the evening as knockabout artists, whilst the Zellia quartette and the Sisters Ivey proved clever and graceful dancers. The subject of the transformation scene is “The Haunt of Mermaids in the Realms of Bliss.” It is painted by Mr. W. T. Hemsley and is a very credible achievement of stage art. The last performance of the pantomime will be given this (Saturday) evening, and there will also be a matinee performance this afternoon at two o’clock.